Fadi Abu-Farha (FADI) received a PhD degree in Mechanical Engineering from the University of Kentucky in 2007. 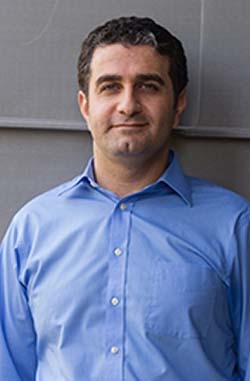 After over three years as an Assistant Professor of Mechanical Engineering at Penn State Erie, Fadi joined Clemson University’s International Center for Automotive Research (CU-ICAR) in January 2012 as an Assistant Professor of Automotive Engineering. Fadi’s prime area of research is “Lightweight Materials and their Manufacturing”; his research activities have been targeting greater utilization of lightweight materials in the transportation sector using cost-effective and energy-efficient manufacturing techniques. Particular topics of interest include: advanced material testing aided by digital image correlation (DIC) and optical metrology, sheet metal forming (characterization, constitutive modeling and FE simulations), hot stamping (HB-CD), adhesive bonding and hybrid-material joining, accumulative roll bonding and shear rolling. Fadi received several best poster/paper/presentation awards at several events including NAMRI/SME, SAE World Congress and TMS. Fadi is a recipient of the NSF-CAREER Award, the USCAR Team Award, the SME Outstanding Young Manufacturing Engineer Award, the SAE Ralph Teetor Award, and the TMS Light Metals Division Award. Accumulative roll bonding and shear rolling.